The Prince George’s County Government is partnering with ServingTogether, a program of EveryMind to offer a Mental Health First Aid: Military and Veteran Module 8 hour course. If you a veteran or an individual working with veterans in our community this is the training for you. Family members and personnel working with military, veterans and families are often not aware of how to engage veterans with mental illnesses and addictions. Mental Health First Aid training aims to increase mental health literacy and to decrease stigmatizing attitudes in our communities. Like regular First Aid or CPR, Mental Health First Aid is designed to give people the skills to help someone who is developing a mental health problem or experiencing a mental health crisis. The course uses role-playing and simulations to demonstrate how to recognize and respond to the warning signs of specific illnesses. 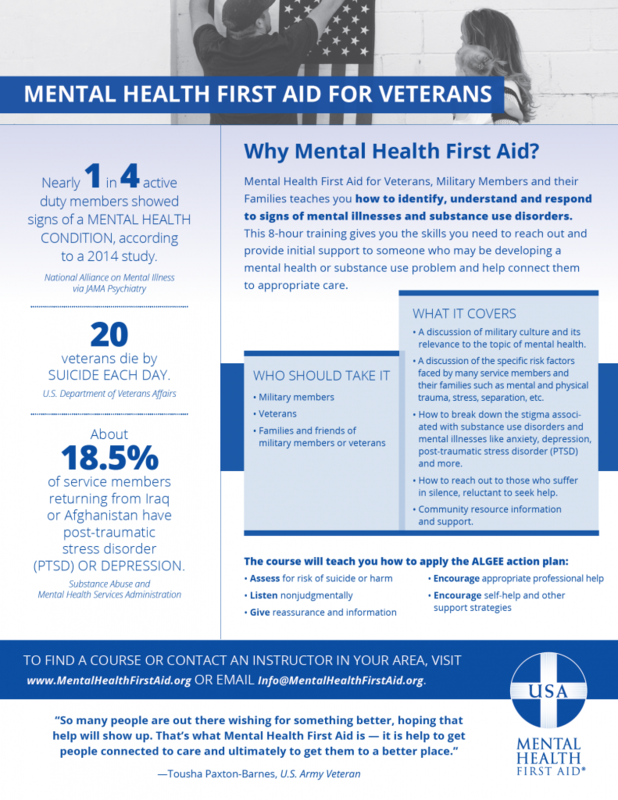 Mental Health First Aid is a valuable resource that can make a difference in the lives of the more than 22 million service members, veterans and their families. Located on the Lower Level in Room L-23. Please note there is a security check point at each entrance to the building. COST: FREE & refreshments and lunch are provided! For questions please contact Christy Kenady at ckenady@every-mind.org.